The tab on this Camaro bumper broke during a really minor collision. 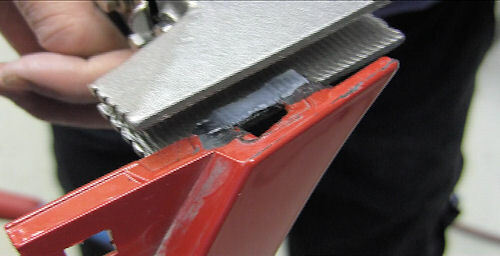 These tabs are fairly common on bumper covers, so, while this repair example is on a Camaro bumper cover, the techniques used will be the same on other bumper covers as well. 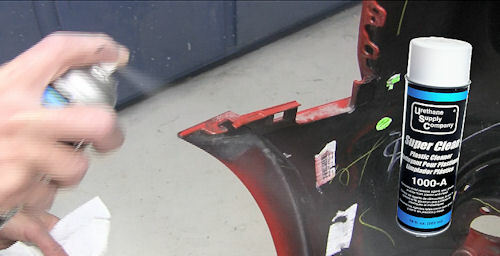 The first step in any quality repair is to clean the repair area. Use a Polyvance plastic cleaner to clean. Spray on a heavy wet coat in a small area, let it sit for a few seconds to dissolve any contamination, then wipe in one direction with a clean paper towel, exposing a clean surface with every wipe. 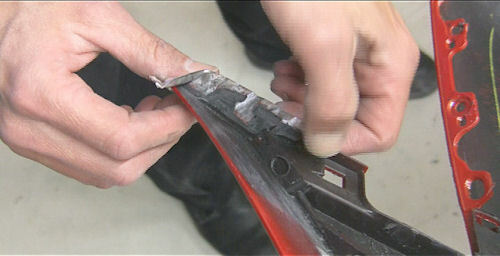 Remove some of the existing plastic so that the added material will not cause the tab to be too thick. Use aluminum body tape as a backing to support the melted plastic until it solidifies. 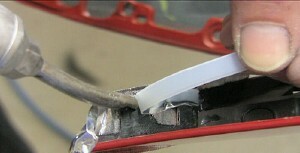 Aluminum tape is stiff and can withstand the heat from the welding process. Using the Nitrogen Switch, change from air to nitrogen. 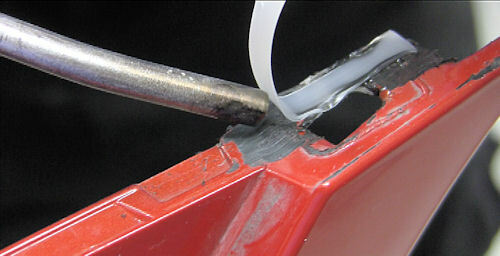 With the R02-03-03-NT polypropylene strip, aim the flow of air at the intersection of the rod and the bumper cover. Be sure to melt both the rod AND the existing plastic. 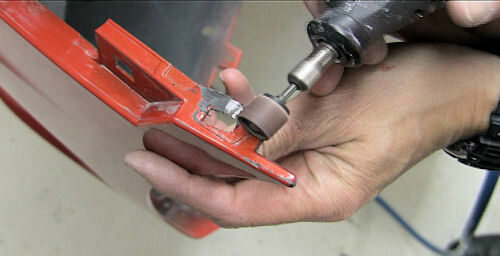 After laying down some plastic, melt away the excess rod with the side of the welding tip. Soften the added material until it turns clear. Be sure to switch the welder back to air after laying down some plastic. 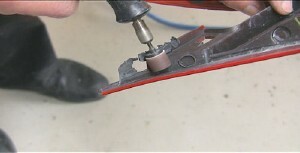 Use a hand seamer tool to compress the melted plastic. This will reduce the amount of grinding and sanding needed later. 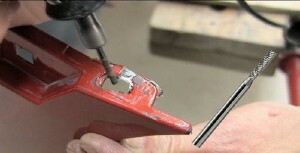 Use a rotary tool with a straight cutting burr to remove excess plastic and to contour the bolt hole. 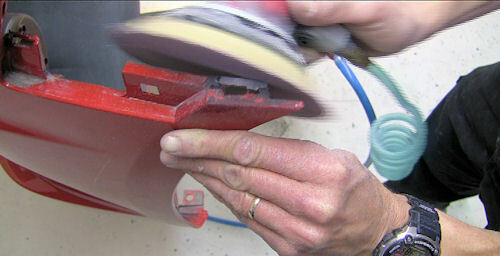 Use a rotary tool with a sanding wheel to make the plastic thinner. Use the R02 polypropylene strip and aim the flow of air at the intersection of the rod and the bumper cover. Be sure to melt both the rod AND the existing plastic. After laying down some plastic, melt away the excess rod with the side of the welding tip. Soften the added material until it turns clear. 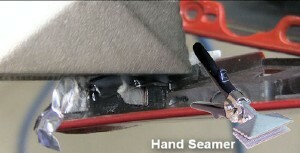 Squish the plastic with a hand seamer to thin-out the tab to the thickness of the existing plastic. The hand seamer also cools off the plastic allowing you to proceed to the next step more quickly. Sand the repair to match the thickness and the contour of the surrounding plastic.